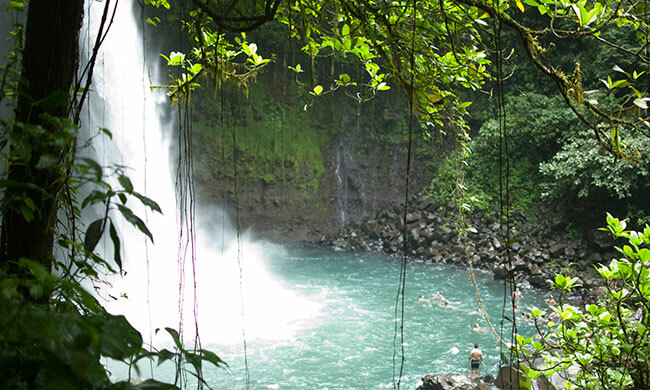 Enjoy Abundant Tropical Wildlife while Horseback Riding to a 320-Foot Waterfall! What better way to see Costa Rica’s beautiful countryside than by horseback riding to La Fortuna Waterfall! Meet your Costa Rican cowboys on a ranch that’s a 15-minute drive from your hotel. They will get you set with your helmet and a short riding demonstration before you head off on your horseback riding adventure! You will pass local cattle farms and tropical forests and be able to enjoy stunning views of the Arenal Volcano, spotting some amazing local birds like oropendolas and toucans on your way. After an hour of riding, you will continue through the woods and make a stop for around 30 minutes at a replica of a Maleku Indigenous tribe ‘palenque’ or thatched-roof cabin. Here you will learn a little about one of Costa Rica’s few remaining indigenous tribes that originates from the Arenal Volcano area. They will exhibit their traditional, indigenous handicrafts and tell you a little about their culture and language. Continue another 30 minutes on horseback where you then leave the horses on the trail. You’ll walk down about five hundred meters (20 minutes) through the forest to arrive at the rocky riverside and the 70-meter high waterfall. At the base of the waterfall, there is a natural pool where you can swim in the fresh water of La Fortuna River for about an hour. Then another 30-minute ride takes you back to the horse barns, where you drive the 15 minutes back to your hotel! Special notes: It is important to let the horse guide know your riding experience. We recommend this tour for people who have had some horseback riding experience or will be fine with a few aches and pains after horseback riding for two hours. The tour lasts for approximately four hours. Weight limitation: 200 lbs maximum. Your tour includes: Transportation, bilingual guide, horse, entrance fee. What to bring: Wear comfortable/waterproof clothes and long pants, closed shoes, hat, sunscreen, swimsuit, towel. *This tour is also available traveling by van. Make sure to let your travel consultant know which of the options you prefer.